Bangalore, July 2018: Sheraton Grand Bangalore Hotel at Brigade Gateway and their business associate Brigade Hospitality have added yet another venue to their portfolio with the launch of The World Café. 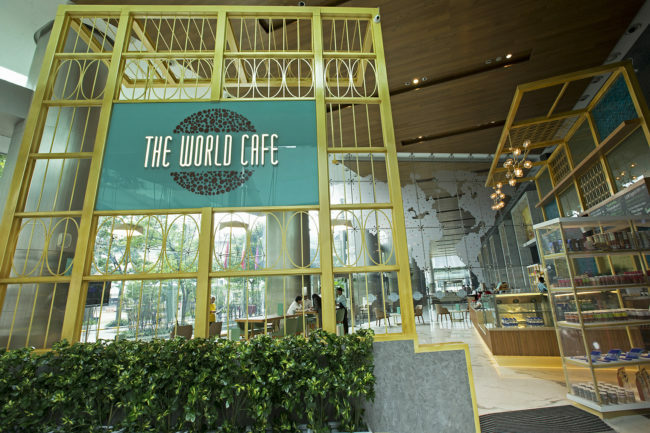 Located in the landmark destination of Bangalore City, World Trade Center, the concept for The World Café was developed along with immense support & involvement from Brigade Hospitality – the perfect place to get people together for a conversation while sipping freshly brewed single origin coffees from around the world and crunching on some scrumptious food. Spread across 2,300 square feet, the combination of glass and chrome interiors contributes the café an elegant ambience that represents true Café culture- one that is relaxed and welcoming. The bistro-style café is designed with simple colours with a modest décor that make the background artful and appeasing music to create an ideal working atmosphere. The World Café features passionately created signature items like single origin coffees, refreshing smoothies, and quick bites. The handpicked single origin coffee beans are sourced from various places, roasted at a controlled heat & time and brewed freshly to give the ultimate way to experience the spirit of coffee. Some of the world’s most famous single origin coffees such as Ethiopian Sidamo, Brazilian Santos, Costa Rica Tarazu and Jamaican Blue Mountain feature in the menu. Apart from exclusive coffees, the Café also offers wide varieties of sandwiches such as Belgian Mitraillette, Aussie Vegemite, Canadian smoked meat rye for breakfast, as well as evening snacks like Grilled Vegetable Pesto, Lamb Pepper Fry, Chicken Jalapeno and decadents such as Baked Cheesecake, Sacher Torte, Opera pastry, to complete your meal. The menu has been carefully curated to suit every palate & to offer great food at any time of the day. It includes coffees with unique new flavours; a selection of crafted teas such as Chamomile, Earl Grey, Moroccan Mint Tea, Oolong Prestige and Vanilla bourbon and much more. Cappuccino, Americano, Latte, and Mocha are only some of the delightful cold coffees that are offered to quench the thirst of the coffee aficionado. The freshly blended delightful shakes and rich smoothies such as Shakerato, Pineapple Passion, Orange Dream Creamsicle, Kaffee Tonic, Affogato, Eiskaffee on the menu make for a truly sinful experience. Mr. S. Sujeet Kumar, General Manager, Sheraton Grand Bangalore Hotel at Brigade Gateway, said, “The World Café is one of our dream projects and we are delighted to launch it at World Trade Center. A great deal of creativity and innovation has gone into bringing out this contemporary Café that reflects on the brand’s vision to introduce a trendsetting global café for the prized guests”. The place is conceptualized with the need to have an outlet for informal meetings where guests can start their day with a healthy breakfast, stop by for delicious lunch and scrumptious evening snacks to end their day. Overall, the place with its vibrant colours gives the feel of being young, positive and energetic. Disclaimer: The Daily Brunch does not hold the credits to the images or the content. Next articleAlila Anji Offers Art Enthusiasts an Opportunity to Get Creative!